It turns out all of the traditional headaches associated with airport security -- body scanners, cranky TSA agents, never ending lines -- might be the least of your concerns when trying to catch a flight. 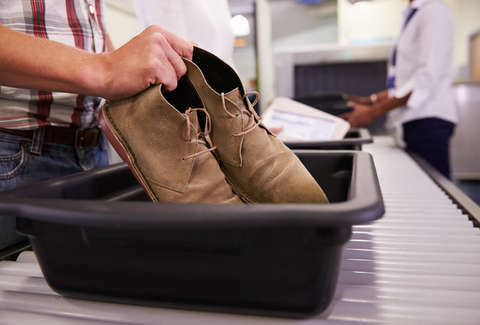 Aside from your average household sponge, which is a bastion of filth in its own right, airport security trays are some of the most bacteria-ridden objects you'll casually encounter. According to a new study published in the journal BMC Infectious Diseases, the trays where you stow your wallet, cell phone, shoes, sun glasses, and keys are teeming with more bacteria than your average airport toilet. The study, conducted by researchers from the University of Nottingham and the Finnish National Institute for Health and Welfare, involved swabbing a variety of surfaces at Finland's Helsinki-Vantaa airport during the busy season in December of 2016. The dirtiest surfaces belonged to security trays, outpacing toilets in traces of rhinovirus -- the bacteria that causes the common cold -- and the influenza A virus. In total, traces of virus-causing bacteria were found on 10% of all surfaces, with security bins the most prevalent. "Of the surfaces tested," the researchers note, "plastic security screening trays appeared to pose the highest potential risk, and handling these is almost inevitable for all embarking passengers." In fact, out of all the surfaces tested, toilets were found to be surprisingly clean, without a trace of respiratory virus detected. The results aren't altogether surprising: Helsinki-Vantaa airport is large facility with an annual passenger count of 18,892,386. Still, it's only a fraction of the size of the biggest airports in the world, some of which service four times as many passengers a year. The number of travelers easily lends itself to spreading germs, especially when you consider how filthy your average cell phone might be. The possibility of contracting a cough or something worse lessens when you board a plane, but only slightly. Airplane cabins are usually a pretty fertile breeding ground for germs. There's also the possibility of aerotoxic syndrome -- which happens when engine exhaust from a plane seeps into the cabin's air supply -- although that's far less likely than contracting a cough or sneeze. With all of this in mind, it remains clear that the key for maintaining health in all of life's ventures is washing your hands after you do anything, anywhere.